Break new boundaries with the ultra high-performance Chrono, Ozone’s first closed-cell de-power foil kite. Our aim was to create the ultimate light wind performance kite for all terrain. Powerful, fast and consistently forward flying, the Chrono is a light wind freeride boosting machine that also excels in racing on the water, land or snow. TECHNOLOGY: The Chrono is at the pinnacle of technical foil design and is Ozone’s first production kite designed with our new re-modeled CAD software; the results are impressive. We used our extensive knowledge in wing development and drew on our history in aerodynamics to create a no expense spared cutting edge foil kite. High Performance Bridle Lines – To keep parasitic drag to a minimum we have used Edelrid performance line. This line is ultra high quality, non-stretch with a reduced diameter helping achieve our goal of maximum performance. High Performance Materials – High-tenacity sail cloth with extremely low porosity values and an overall lightweight enabled us to further stabilise the canopy and maximise fast flight characteristics. If you are looking to get the most out of your light wind sessions, the Chrono will peak your experience. With incredible upwind performance, low-end grunt and huge float in jumps it will have you ripping! The Chrono is a closed cell foil and has great water re-launch, but we recommend that you keep it flying and out of the water if possible! A drainage system on the wing tip allows any water that may have entered the kite to drain out. The Chrono is not a wave kite and should not be used in waves. The Ozone Chrono is the first all terrain (water & land) kite Ozone made. And its a very well manufactured high performance foil. Under the 8 knots you will ride and stay upwind with the 18m. You got two choices to ride and stay upwind in 6 knots wind. Ozone Chrono or Flysurfer Speed4. The Ozone Chrono had the same low-end as the Flysurfer Speed4 18m and the better upwind & high-end performance. But we think the Chrono needs some tweaking like faster turning and a bit more stable canopy profile. Like to glide? Yes then you need a Chrono. Snowkiters in small hills will love its gliding performance. Also in the snowkite race scene the riders love this new foil kite, great low-end & great upwind performance. Ozone Chrono vs Flysurfer Speed4? Very short! 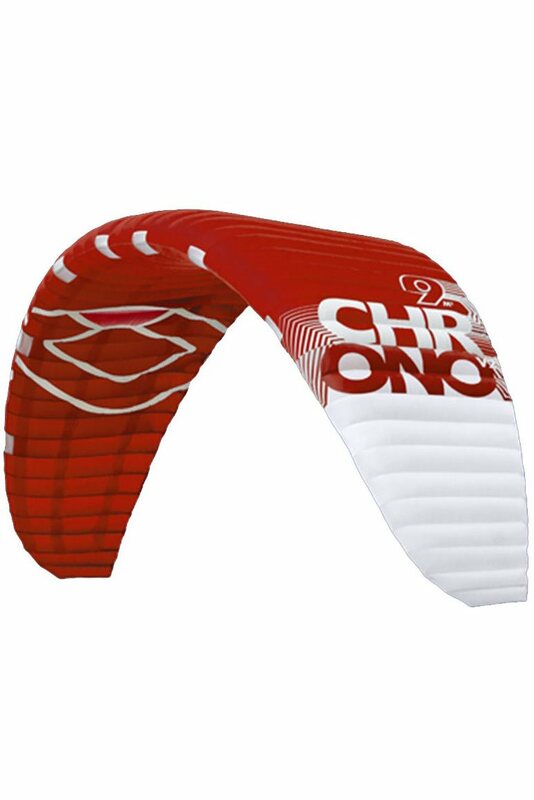 Ozone Chrono for the experienced foil kiter who's looking for high end performance! The Ozone Chrono likes to climb to the edge of the wind window. Wind power is direct acceleration! Wow, great low end kite. Incredible float. Need a bit kitefeel to get the right performance out of it, but a great and playful low end kite. Used it for, strapless flat water tricks, riding under 8 knots with a 45 wide twintip. Easy with my weight! Below is a review that I wrote (in Dutch) for the Dutch Kitesurfmagazine. I have translated it to English with Google translate in order to share it with you. I think the English is good enough now for you to read...sorry, I didn't have the time to completely rewrite it in 'real' English. Upon opening the kite bag the Chrono you notice that you are dealing with an Ozone kite, every detail has been paid attention to. The zipper of the new bag has two tabs, which significantly reduces the canvas gets stick in the zipper; something we've all had experience with. Speaking of opportunities, this kite significantly increases your chances to win a course race, but more about that later. It's quite a shock for an experienced kiter LEI in rolling out the kite. At first glance the bridle lines seem to be in a huge tangle. Fortunately, the opposite is true. On the trailing edge of the kite is a piece of Velcro that keeps the ends of the bridle lines tidy. If you use this the bridle lines are not tangled and can easily be shaken apart. It is not even necessary to remove the lines from the bar as Ozone advises. Preparing the Chrono for a kite session is slightly different than for an LEI kite, but especially with little wind, can be done completely independently. A handy instructional video can be found on flyozone.com. The kite is placed on the beach with a tip in the wind and then rolled out with the wind. A handful of sand at the tip ensures that the kite does not fly. Then roll the lines 3 feet from the bar and put this down on the side of the trailing edge. You loosen the velcro strap and shake the left and right bridle lines loose. Then you can roll out the lines of the bar perpendicular to the wind. The bar is equal to the standard Ozone freeride bar, with the difference that there is a line between the control lines. This line, which serves as a 'brake handle ", can be used to land the kite in a controlled manner. In this test, the Ozone race bar as used. The weight of the Chrono 18 is with 3.1 kg significantly lower than the Edge 17m (4,1kg) and 19m (4.4kg). A whole set of Chrono's (12.15.18) is 4 kg lighter than a comparable set Edges (11/15/19). When traveling by plane this is a nice side effect. Starting the Chrono can be done in two ways: the 'hot launch' or sand on the tip. In the latter method do you walk with the bar in the wind up to about 45 degrees, and enter gradually the tension on the control line of the tip in which no sand is on. The kite will fill with air, and slowly come to life. If the kite is well filled, you give more pressure on the control line and you can send the kite up in the air. The tip with sand slowly slides downwind on the beach. If you perform these operations too quick, the tips will not fill well, making the kite not hang well in the air. By alternately pulling the left and right steering line and the brake handle, the kite is filled with air. The hot launch is very simple, but is not recommended in stronger winds. Ozone advises the hot launch up to 6 knots. In the test, however, it was also done without any problems at 10-12 knots, but you should take care, because the kite can get very powerful. In the hot launch you lay the kite with the trailing edge into the wind and start your kite fully downwind. You keep the bar fully powered while you pull on the power lines. The leading edge now now comes up and the kite slowly fills with air through the air inlet holes. If there is enough air in the kite, then let go of the power lines and slowly depower the kite. Chrono then climbs up. Optionally, as the kite hangs above you, you can pull the steering lines and brake handle to completely fill the tips with air. Ozone advises to keep the Chrono not straight above you on the beach because of the lift that the kite can generate. The kite flies so far to the edge of the wind window, it looks like he is overflying it. He obviously does not do that, but it's just a few degrees more than other high aspect LEI kites. The kite hangs stable in the air. The bar pressure is medium to light, but the kite is not responding as quickly as you are used to from a 17m Edge for example. When the Chrono is on the edge of the wind window, it is relatively sensitive to gusts. On the beach you have to keep your attention on the kite, especially the first few times. However, if there is enough wind gusts are relatively easy to control. With less wind it is harder, and it is quite difficult to keep the kite still in the air on the lower wind limit. Once the kite is not moving in these winds, the tips tend to lose some air. The collapse of the tips is incidentally also described on the internet as an area for improvement of the Chrono. However, with sufficient wind, this is usually a result of a steering error, and resolves automatically. Spending a lot of time with the kite on the water is the solution here. Both the upwind and downwind course is more than good with the Chrono. Downwind is slightly more difficult in the beginning because the kite relatively quickly loses its profile. However, you get used to this pretty smoothly, especially if you turn the steering lines on the tightest position at the bar. You then can put just a little more tension on the steering lines. With some practice, you can easily go just a bit more downwind than with the Edge. The speed you can achieve on the halfwind and downwind course is phenomenal. At the Delta Lloyd Regatta in late May 2014 the worlds best kite racers were present. On a training evening were reigning world champion Florian Grueber, Ricardo Lecesse (number 2) and Alejandro Climent (number 5) on the IJsselmeer at Medemblik with a good 10 knots. Three kite racers of similar level. Florian with a 17m Edge, Alejandro with a 19m Edge, and Ricci with a 18m Chrono. With every up and downwind race, Ricci won easily !! The Chrono has a tendency to rotate around the tip, and he therefore has a relatively large turning circle. In a downwind course you should be very careful with you downloops, otherwise there is a risk that you hit the water with a tip. With some practice and fully depower with extreme steering of the kite, you can downloop without problems, but you should take care. If the Chrono unfortunately hits the water, then the restart is no problem if the kite lies with the leading edge lon the water. Extremely pulling on both steering lines with the brake handle causes the kite to go up and turnaround. If the kite falls flat on the water is the relaunch is trickier, especially with little wind. Landing the kite is super simple. Just as you're used to with an LEI kite. Instruct your help good that he picks up the kite at the tip. If you do not have help and if the wind is not too strong you can even do it alone. Grasp the brake handle with both hands, stalling the kite and he sinks slowly downwind. As soon as he lies on the ground in front of you, hook your chicken loop and the brake handle to a supplied 'herring' that you have put in the beach. The kite remains on the beach and you can calmly walk to stowe it for the next session. The Ozone Chrono is causing a revolution. The upper echelons of the IKA course race rankings are now dominated by kiters who sail the Chrono. However, the Chrono is not the appropriate light wind kite for everyone. For the experienced racer it's an easy choice. With a race board, foil board or free race board you can easily go with 6 knots. With less wind and the right technique that may also be possible, because the Chrono will hang in the air with 4 knots. The less experienced racer is probably better off with a kite as the Edge 17m or 19m, or a similar race kite. The experienced freerider who is looking for the ultimate light wind kite will be able to stay upwind with 8 knots with a Chrono 18 on a twintip. With some practice jumping is even possible. The hang time is particularly good and landings are super smooth, and of course: the stronger the wind the higher and longer the jumps (hit the brake handle in the middle of a jump!!!). The landing remains without too much trouble very soft, you have screw up massively to get a hard landing with this kite. I already tested the 18m and that was a light wind monster. I was excited to try the 12m in the snow. Totally different conditions as in the water of course, but I was curious how this closed cell race kite performer would handle the mountains. First this is a kite for experienced riders, you need flying skills to understand and get the most out of the Chrono. The Chrono likes airflow around its canopy and this kite can turn around like a propeller, but if the airflow stops the wing tips can collapse a bit. A bit bigger turning circle will be the remedy of this small instability. So be gentle, feel and you have a very playful kite in your hands. Fast acceleration, fast turning, aggressive pop for a foil and great feedback. The most exciting part of the Chrono is that this foil has a great de-power and slides to the wind window if de-powered. Not many foils do that! That wider wind window gives gives you a kite with a wide wind range. Good low-end and great high-end. We tested the Ozone Chrono in 2 difficult situations. Once in total fog, with windspeed not exceeding 6 knots, and once with gusty inland wind from 4 till 12 knots. Ozone 's trying to bring a new shape on the market and the first thing you feel is their experience in paragliding. While starting the chrono it takes a while before the tips are fully filled, which may be cause its long thin shape. We noticed its wide windwindow when you let the kite fly and surf on a real light wind twin tip. It accelerates and want to crawl further and further in the corner. This may also be the reason why its a bit unstable in gusts. The Chrono is a true performance kite with a cool feature: when you pull the break line while jumping the kite generates extra lift and even makes you fly further under the kite, till a point where the kite is outside the windwindow after the landing. Make sure you keep the kite in the windwindow at all times! Tested the Ozone Chrono 18m on the water in a 5 to 12 knots wind range. These all terrain kites (Water & land) have a great low end. It's clear, you need a foil for the best low-end light wind performance. Foils are always a bit slower than tubes. With a 150x 45 twintip we were on our way with 6 knots. And that is a big issue for people who live inland. This Chrono is a small paraglide with de-power. It wants to glide Snowkiters who're used to foils will love its gliding performance in the hills. But the Chrono is a bit raw, need some tweaking like a smaller turning circle and more stability would be great. On the water, you go upwind under 8 knots. Around 12 knots you still fly the Chrono easily. Jump and pull the brake line :-) Straight up action. If you are an experienced foil rider you will feel the performance. Tube riders have to adapt to the new foil feeling, but you will get the best light wind performance.